The higher you go, the more powerful you become, the more bounties God gives you, maintain humility. Humility does not mean weakness. True humility is a sign of greatness. 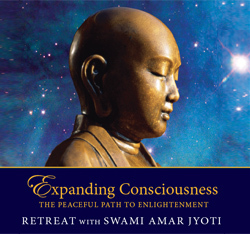 In this retreat, given at Sacred Mountain Ashram in 1996, Swami Amar Jyoti asks us to reassess our lives as seekers. He guides us to awaken our soul level intelligence and intuition. He explains how the Satguru comes to help us, and offers a tension-free method of working with the mind, based upon Vedanta. Throughout these six Satsangs, Gurudeva offers a peaceful path to Enlightenment, where we transcend fear and are unaffected by outer disturbances. He stresses how faith and reliance on the Divine are essential to awaken our consciousness at this important moment in Earth’s evolution.